I’ve never fully understood the appeal of horror movies. After all, what’s the point in paying good money for something that’s going to make you want to pee your pants? On the other hand, purchasing beer always seems like a wise financial decision, despite its similar bladder-assaulting properties. Now, there’s a place where both fright fiends and fans of fermented barley can get their fix, the horror bar Sacrifice. Located in Omuta City at the very southern tip of Fukuoka Prefecture, Sacrifice may not be precisely what everyone is looking for in a watering hole, but you can’t fault the management for not being upfront about what the establishment is. The sign out front says “horror bar,” and we can’t imagine a more accurate description. The wall above the counter is decorated with lovingly framed portraits of some of horror cinema’s most iconic leading men, including Frankenstein’s monster, Jason Voorhees, and Freddy Krueger. There’s also a neatly arranged line of illuminated skulls behind the bar, though whether these are manifestations of dark spirits or all that remains of the victims of the above-mentioned killers remains unclear. Like most bars in Japan, Sacrifice charges a cover. There’s really no need to ask how much it is, as of course there’s only one logical answer. 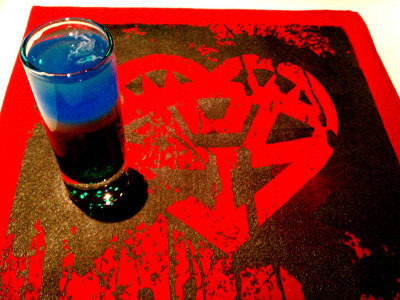 The cocktail menu has similarly sinister sensibilities, starting with internationally acknowledged concoctions such as the Exorcist, a mixture of tequila, Blue Curacao, and lime juice. Sacrifice also has a number of its own creations, all named after horror characters such as Jason, Hellraiser’s Pinhead, and Texas Chainsaw Massacre’s Leatherface. Here we see the drink inspired by Chucky, the “nostalgic” (according to Sacrifice’s owner) killer doll from Child’s Play. The cocktail consists of a glass of soda water, into which a shot of liquor is poured. Being located in Japan, Sacrifice also takes cues from domestic tales of terror, as with this caramel and coffee infused libation named after Otsuyu, the seductive ghost from folktale Botan Doro, also known as The Peony Lantern. The owner of Sacrifice is undeniably a creative, visually-focused person, and counts designing websites, drawing manga comics, and even making bags among his hobbies. Let’s see what sort of fashionable carryalls he’s produced. ▼ Did we say fashionable? We meant night-terror inducing. Sorry, we get those two terms mixed up a lot. That said, you don’t decide to open a “horror bar” if your favorite artistic motifs are rainbows and butterflies (well, maybe if the butterflies are jet black harbingers of death for whoever’s shoulder they alight on). Sacrifice’s owner is so committed to horror that he wasn’t fully satisfied with the mannequin he planned to decorate the bar with in the state shown directly below. Nope, that zombie-grade alabaster skin and soulless black orbs instead of proper eyeballs just wasn’t producing enough uneasiness. So the owner did the only thing he could by giving it a remake to make it look more like Regan, the possessed child from The Exorcist. Now renamed Reganko, the owner credits her bewitching good looks for helping to attract customers to the bar. “Really, Sacrifice isn’t such a scary place. Actually, it’s rather comfortable,” says the bar’s owner, who clearly has a different definition of that last word than we do. Sacrifice even keeps patrons entertained with a large projection screen on which it shows videos of TV reports of UFO sightings and paranormal activity. Customers who bring in a recording from their own collection and agree to loan it to the bar for a few days are rewarded with discount coupons. 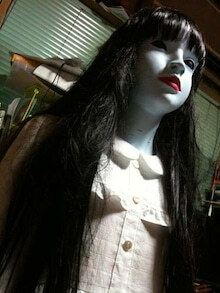 The projector is also used to screen films from the owner’s extensive library of horror movies. Apparently, if you’re the only customer at the time, you can even request which one you want to watch, but if you can sit in Sacrifice and enjoy a drink all by yourself, you’re made of sterner stuff than us.